With a population of over 12 million, or about 10 percent of Japan's population and with a population density of 5,736 persons per square kilometer, Tokyo is by far the country's most populous and most densely populated prefecture. So let’s put 30,000 runners along with 10,000 volunteers on the streets, close some of the major streets for up to 7 hours and have a foot race. Let’s make sure we hit all the big places too like: Shinjuku -- Iidabashi -- Imperial Palace -- Hibiya -- Shinagawa -- Ginza -- Nihombashi -- Asakusa Kaminari-mon Gate -- Tsukiji -- Ariake -- Tokyo Big Sight. If you build it they will come. 95,000 people registered for the event. 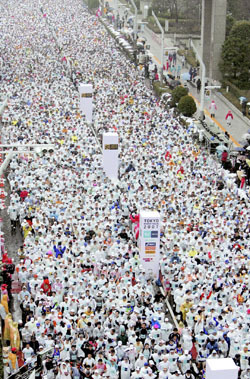 30,000 were chosen by lottery (5,000 for the 10k and 25,000 for the marathon). I was lucky enough to be one. Thousands of people lined the streets to cheer for friends, family and people they didn’t even know. The organizers did an exceptional job and the citizens were unbelievable in their enthusiasm. The newspapers reported there were some unhappy merchants and restaurant owners who were not pleased that their business suffered some that day due to street closings and restrictive crowds. But from my perspective it was hard to find them. In preparation for the event I began checking the long term weather forecasts weeks prior to the event. The forecasts would vacillate between predicting sunny weather or mostly cloudy or rain for Sunday, February 18. On the Wednesday before the race the forecast began to steadily predict rain, an 80% chance. By early Friday it was 90% and on Saturday morning a 100% chance. Even though the days prior were beautiful the clouds rolled in on Saturday afternoon and by night it was raining. My stomach began to hurt. On Sunday morning at 7:30 I left the hotel to make my way to the appointed starting place. It was still raining and my stomach still hurting. As I made my way to the subway I could see other runners, distinguishable by their drop bags (bags the organizers provided to transport the participants personal items to the finish line), were making their way too. I began to feel better; I wasn’t the only crazy one. I must admit that standing in the pouring rain and 5 degree C temperature for 40 minutes waiting to start wasn’t enjoyable. What ever cushioning and support my shoes used to provide had washed away with the rain down the drains. I even considered just walking away. I kept thinking that one of the 65,000 that wasn’t chosen would gladly take my place. So I stayed. The crowd and the pre-race ceremonies were inspiring and soon I would be moving anyway. The start finally came and it took me 4 minutes just to cross the starting line. I guess all the rain had an effect on some of the male runners. At the first underpass about 20 of them lined up to pee on the abutment. The young girls gasped then laughed. I imagined they were laughing at the shrinking effect the cold rain may have had. I made it until the 35km mark before I had to go. I can no longer say I have never seen a port-a-benjo! Along the route just when I would think all of my energy was gone a brass band would strike or the Taiko drummers would begin or the crowd would chant in Japanese and in English their encouragement. I heard, “good job”, “looking good” and one lady who was little off on her phrase yelled “good looking”. I knew what she meant. At one point some high school cheerleaders did their routines. I think they were probably cold. But the best was at the 40km mark and was a little boy with his mother. He was holding a home made sign that simply said, “SMILE”. As I ran by he was smiling a huge smile with a couple of front teeth missing. That was just what I needed to finish and as I crossed the finish line I was sporting a grin from ear to ear, just as the organizers had suggested we should do. Immediately after crossing the finish I was grabbed by the arm and pulled to one side. A camera was shoved in my face along with a microphone and a young Japanese reporter asked, “How do you feel?” I began to remember all that I had been thinking during the race, about how the organizers and sponsors had done such a good job and should be proud. How everyone had turned out to support the event and had shown such unity. But all that came out of my mouth was, “I’m tired, very tired.” I don’t think the spot was aired.